Wreckage of a beachfront home in Mantoloking in the immediate aftermath of superstorm Sandy. 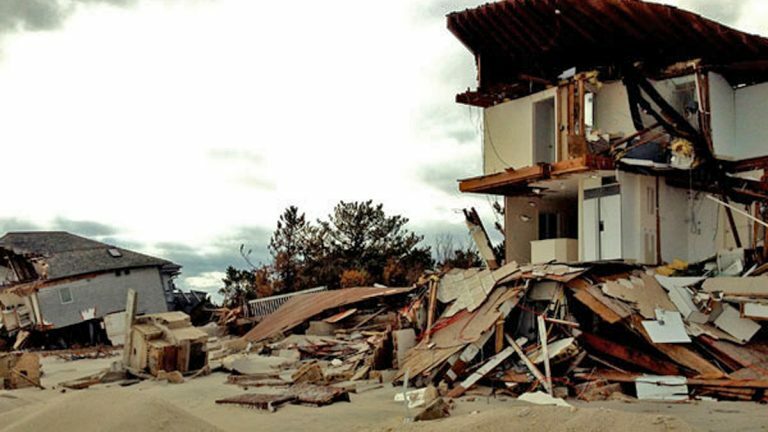 When superstorm Sandy made landfall in Brigantine, NJ, late on the evening of October 29, 2012, it was immediately clear that the state’s recovery would be a long-term process. As state officials wrote in their action plan applying for aid from the federal government, more than 40,000 primary homes and 15,000 rental units had sustained “severe” or “major” damage from the storm. Boardwalks up and down the coast were replaced by piles of rubble, and damage estimates totaled tens of billions of dollars. But despite the scene, many storm victims remained cautiously optimistic that things would work out in the end, and that the end wasn’t too far over the horizon. People trusted that flood and homeowners insurance would kick in to cover their losses, and that aid money from the state and federal governments would come through to help them rebuild and get back on their feet. Three years later, while some storm victims are back in their homes, many thousands more are still waiting to complete the process, amid being shortchanged dramatically on their flood-insurance claims, facing problems with banks and contractors, and sustaining lengthy delays in getting recovery checks from the state. On this, the third anniversary of the storm, here’s a look at where the recovery stands and some of the key lessons it’s taught for how to handle future storms. “Three years since Sandy made landfall, the NJ Department of Community Affairs remains as hard at work as ever on the recovery effort,” said spokeswoman Lisa Ryan. Though just 2,000 of the 8,000 families in the state’s largest homeowner-grant program have completed construction and are back in their homes, that number has doubled in the past six months, and the vast majority of participants have received at least an initial payment. In addition, Ryan said the process continues to gather steam, with about 50 homes finishing construction and $7 million now being distributed to homeowners in an average week. A Monmouth University poll released yesterday found that some 60 percent of Sandy victims — including many who have completed construction — remain dissatisfied with the state’s recovery efforts, and two-thirds said they felt that people like them had been forgotten. What’s more, 12 percent of respondents considered themselves “permanently displaced,” meaning they don’t expect to ever be able to return home. Meanwhile, according to a Rutgers-Eagleton survey out today, more than half of New Jerseyans believe the state has still not fully recovered. Last year, for the second anniversary of Sandy, NJ Spotlight partnered with WNYC Radio and public radio station WWNO in New Orleans for an in-depth look at how disaster recovery tends to be fraught with obstacles and challenges, leading to a number of problems that were evident not just here in New Jersey, but also after previous storms like Hurricanes Katrina and Ike. After each storm, officials try to learn from the mistakes of the past and incorporate changes to ensure a smoother recovery, but new problems inevitably arise. Our reporting led to a number ofrecommendations for improvement, including reduced federal bureaucracy, more oversight for private contractors, and the proposed creation of a step-by-step “cookbook” to help states and cities better and more quickly recover. Here are the responses we’ve received. Over the past three years, the Fair Share Housing Center has been a vocal advocate for poor and minority homeowners and renters struggling to rebound from the storm. It’s also been a fierce critic of Trenton’s handling of the recovery, taking the Christie administration to court to demand greater transparency of the behind-the-scenes workings of the state’s housing-recovery grant programs. To staff attorney Adam Gordon, many of the problems and delays that have occurred have resulted from what he views as the state’s failure initially after the storm to set up processes that fairly and effectively helped people affected by Sandy get the support and resources they needed in order to rebuild. For example, he noted that storm victims had to apply separately, multiple times for different grant programs rather than filling out a single application that could be used for various purposes. That increased the amount of paperwork, bureaucracy, and general frustration among everyone involved. From his perspective as Legislative Committee chair at the New Jersey Association for Floodplain Management, John Miller worries that tiny towns along the coast were forced to largely fend for themselves in navigating the complicated rebuilding process, sometimes amid unclear and conflicting regulations. The main lesson for him is the need for more leadership from the top. Chris Sturm at New Jersey Future — which advocates “responsible land-use policies” — similarly agrees that the biggest lesson from Sandy is that the state needs to focus more on permanent solutions to keep people and their property out of harm’s way. “We need to be looking to science and using fact-based analysis to drive our decision-making,” she continued. “We saw recently in that last storm, a lot of the new dunes or portions of them washed away. We’re elevating homes in neighborhoods where the streets continue to flood at high tides. We’ve been looking for comfortable solutions for what, in the long-term, is really a very uncomfortable problem. So we’re more prepared in an emergency, but we’re not prepared for the kinds of risks we’re facing. Those hard truths, she said, include facing the reality that we can’t always engineer our way out of risk, and that some coastal neighborhoods might simply be too vulnerable and expensive for us to continue to rebuild after every storm. For Sue Marticek, Executive Director of the Ocean County Long Term Recovery Group, the lesson is twofold. First, she joins the chorus of angry voices demanding meaningful reforms to the National Flood Insurance Program. From her firsthand experience working with storm victims, being shortchanged on insurance claims appears to be the No. 1 reason New Jersey’s recovery isn’t farther along than it is. Marticek’s second key lesson from Sandy is that involvement from private charitiesis essential for a smooth recovery process. Amanda Devecka-Rinear with New Jersey Organizing Project — the group of Sandy victims camped out this week near the State House — sees things from an even more local, on-the-ground perspective. “After a big disaster, I think there’s a sense that people need to be served, and they do. But actually, people also need to be active participants in determining the future of their neighborhood and communities, and that’s a different thing,” she said. Here in New Jersey, she said, it’s been a struggle for average Sandy victims to get a seat at the table.